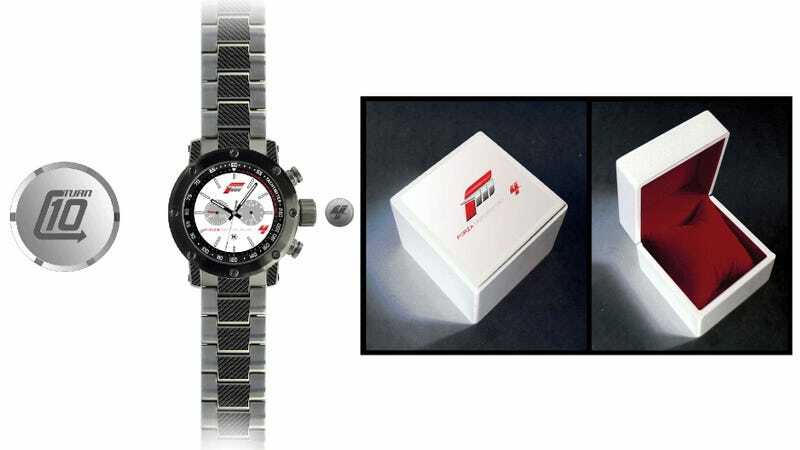 Okay, I suppose someone might share or pass down this limited edition Forza Motorsports 4 watch from Level Up Wear, but with only 500 total being made available in the U.S. and UK, but with only 500 being made they might be better off just hanging onto it. Do people even wear watches anymore? With every tiny piece of electronic equipment I own sporting its own time-telling feature, the good old watch looks to me like something you put on the shelf, pulling it down for special occasions like your daughter getting married, just to show her fiancée you have a rather nifty watch sitting around. That's the sort of thing that will impress him. That and your fine collection of loaded guns. Where was I? Oh yes, the watch. Crafted in conjunction with Forza developer Turn 10, this limited edition beauty has a number of features that watch people will no doubt find compelling. I shall paste them here. Be compelled. If that doesn't excite watch fans then I don't know what will. Heck, if that does excite watch fans I still don't know what will. I just know it's pretty, shiny, and it's available for preorder at $170 USD or £130.00, depending on where you buy it. Plus it comes with a lovely case and a certificate indicating that yep, it's one of them watches. Want one? There are links to click.